Q: Is there a fear that since these Challenges increase that speed, that it will then be too easy to get to the Pro Tiers? Scott: No, because once you get to the Pro Tiers, you're still getting those rare items, you know? For me, my first consideration is, "What is the most fun and rewarding thing about Rocket Pass?" That drives everything else. I think getting those Pro Tier Items, and not knowing what's going to happen when you get them because you might get those Titanium White Special Edition Wheels or you might not, is the fun of it. That could happen with every Pro Tier, and so we have no qualms about people getting there sooner. If there was an early end to the Pro Tiers, then yeah it would be a factor. But we have so many variations of items, we think fans will be happy with what they find. Q: Are there more variations to items in Rocket Pass 3 compared to earlier Rocket Passes? Scott: Yes. One of the things we did was really look at what people were equipping, while also listening to Community Posts. We saw that for items that had three Tiers, except for cars, the first two Tiers were mostly going unused. At the same time, people like the variety of wheels. So what we did was, make it so that most Wheels have two Tiers instead of three, but there are now more Wheels to choose from and that adds a greater overall variety in the Pro Tiers. Q: What were some of the big 'Challenges' when implementing Challenges? Scott: It really was a good design exercise, because unlike some other games when you can rely on performing things like headshots or specific actions for a character class or hero (like in DOTA), we are a game that focuses on core gameplay. So, we can't say, "Hey, go score a bunch of goals!" Then you're not rotating. You're chasing your Challenges. So we wanted Challenges that were fun, interesting, and didn't corrode core gameplay. Nothing we add will ever change core gameplay. That's where the good stuff is. Instead of having a different Save Challenge, Goal Challenge, or Assist Challenge, we came up with the idea of grouping those together. So, one Challenge may be to get "X number of Saves, Goals, or Assists" to complete this Challenge. Earning that Challenge means you ARE rotating. Even if your playstyle is not to rotate, you can still do the Challenge and it's not going to hold you back. Q: What's the most a Challenge changes the game? Scott: To reiterate, our main intent is that no Challenge changes the core gameplay, which is why there are some Challenges with specific Battle-Cars or specific cosmetics involved. In fact, they're almost all based on cosmetic items within Rocket Pass 3. Any Challenge from the Free Track involves items from the Free Track. So, we'll never say that you have to upgrade to complete a Free Challenge. We have a very specific class of Challenges that are focused on Rocket Pass Premium for those who upgraded. We're not going to cross those lines. The intent is that you should be trying to get through Rocket Pass. We want you to always be pursuing a goal. For this first set of Challenges, we're going pretty easy on you. We're saying, "wear this topper" for a Week 4 Challenge that you'll probably be getting in Week 1. We looked at player behavior and how players on the Free Track progress during a Rocket Pass and we wanted to give a buffer so that most people can easily accomplish those. Q: What do you hope players get out of these Challenges? Scott: I hope they get through Tiers 1 through 70 faster. I want that extra progression for players to get all those Tier Points that go toward your progression. I'm a guy who really likes the progression aspect of a lot of games. You know the, "I'm almost there, one more game" mentality right? Those always feel like an add to me, and also I want to make sure we're leaning on the "fast and fluid" gameplay so that it doesn't feel like a grind. It's basically just faster than normal. 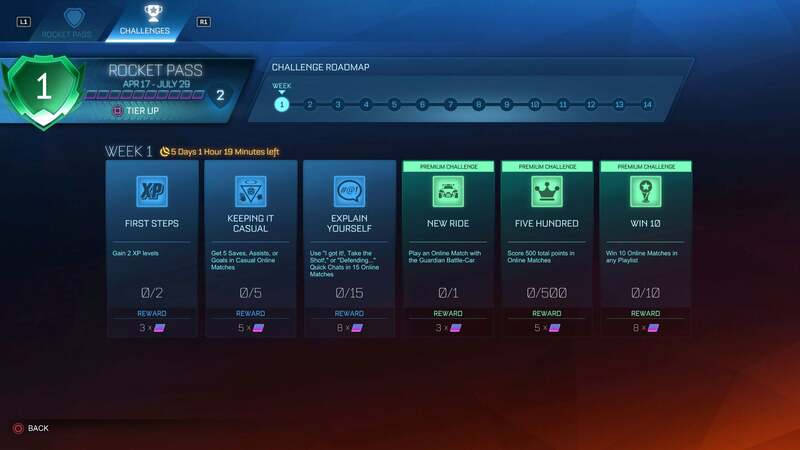 If you never do a single Challenge in Rocket Pass 3, you would still progress at the same rate of Rocket Pass 1 and 2. Challenges are just extra for you. Q: Do you think the way we progress through the Tiers will ever change? Scott: We'll always look at data and community feedback. If people don't like something, I'd consider a change of course. I want to make sure I'm fulfilling the community. I want to make sure that they're happy and in there playing. We will look at it and change things that need to be changed. Q: Weekly Challenges are a big thing across all video games. How are Rocket League's Weekly Challenges different from other games? Scott: We didn't want to reinvent the system itself. Challenges are a major convention in video games at this point and they all work, more or less, the same. 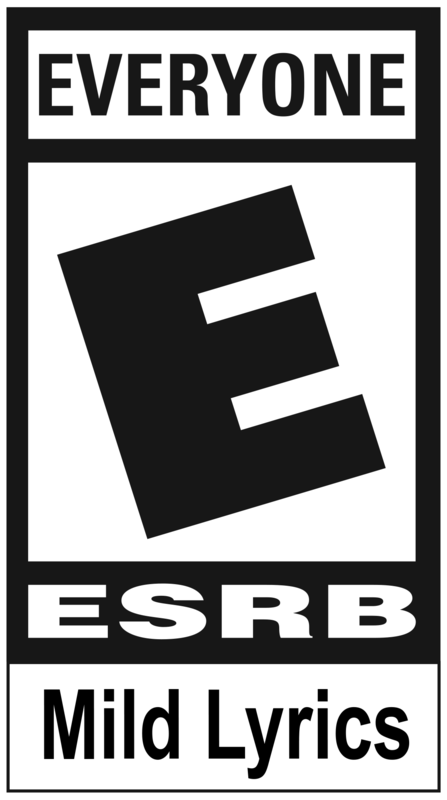 Our main variation is the non-impact of the core gameplay. You don't have to play differently to complete our Challenges. That is the intent. I think that's the major difference. These are things you would be doing anyway. We want you to get in there and play more and now, you can climb those Tiers faster. Q: One way these Challenges are unique is that they're locked within their week. Scott: Right. You can't progress on a Challenge that has expired. But, just like how you get all the items if you play the Free Track all the way to Tier 70 and then upgrade to Rocket Pass Premium to get those items too, we're also doing that with completed Challenges—meaning that if you met the requirements of the Challenge but weren't Premium at the time, upgrading automatically rewards you for what you have already accomplished. It's just another reason to get Rocket Pass Premium. Q: Playing devil's advocate here, some people like when Challenges pile up at the end of the season, which you won't be able to do in Rocket Pass 3 since Challenges expire. What was behind that design choice? Scott: It was not an easy choice. One of the things we're going for is to give players week-to-week reasons to play. Part of the reason why we added Challenges in the first place was to get people to play regularly instead of binging at the end of Rocket Pass. If we left it where you could end up with a huge laundry list at the end of the Rocket Pass, it would feel like, "how am I ever going to complete all of these?" Number two: if we have Challenges carrying over from week to week, then we haven't given players that week-to-week reason to play. Q: What do you think the future holds for Rocket Pass and Challenges? Scott: We have a laundry list of small incentives and quality-of-life stuff that we know about now that we plan to address. But, I think that with this being the first Rocket Pass with Challenges, we're going to continue to watch, listen, and learn a lot before we commit to any kind of big change. As a designer, you make a system that you have an idea about how you think people are going to play it, and then oftentimes, you can be wrong! That's actually beautiful. Emergent gameplay is just fantastic. I think Rocket League is one of the prime examples of that. When the team first shipped it, nobody had any idea that people would be able to do what they can do now. It really grows beyond your original intention, hopes, and desires. I think Challenges may be one of those where we just see what people can do with these. 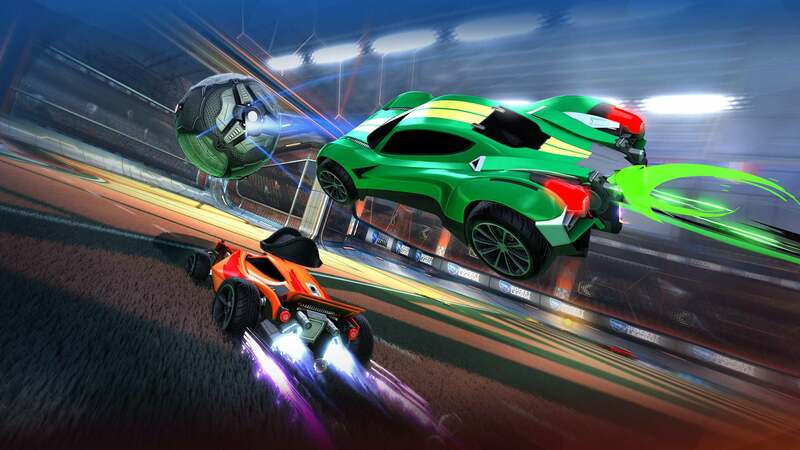 Get ready for Rocket Pass 3 with Challenges on April 17—the day after the Esports Shop Update goes live on all platforms!